Last major update issued on March 28, 2004 at 05:55 UTC. The geomagnetic field was quiet to active on March 27. Solar wind speed ranged between 468 and 980 km/sec. A high speed stream from coronal hole CH87 was observed arriving at SOHO at 16:30 UTC. Within a few hours solar wind speed increased from from 600 to nearly 1000 km/sec. Solar flux measured at 20h UTC on 2.8 GHz was 127.6. The planetary A index was 14 (STAR Ap - based on the mean of three hour interval ap indices: 15.3). Three hour interval K indices: 31233434 (planetary), 32333435 (Boulder). At midnight there were 8 spotted regions on the visible disk. The solar flare activity level was low. A total of 5 C class events was recorded during the day. Region 10577 decayed slowly and quietly. Region 10578 decayed and lost penumbra on the leading spots. Region 10582 decayed slightly as negative polarity spots at the southern edge of the largest (leading positive polarity) penumbra moved slowly away. An M class flare is still possible. New region 10583 emerged in the northwest quadrant on March 25 and was noticed by SEC two days later. The region will soon rotate over the northwest limb. New region 10584 emerged in the southeast quadrant on March 25 and was numbered by SEC two days later. New region 10585 rotated into view at the southeast limb on March 25 and was recorded by SEC two days afterwards. 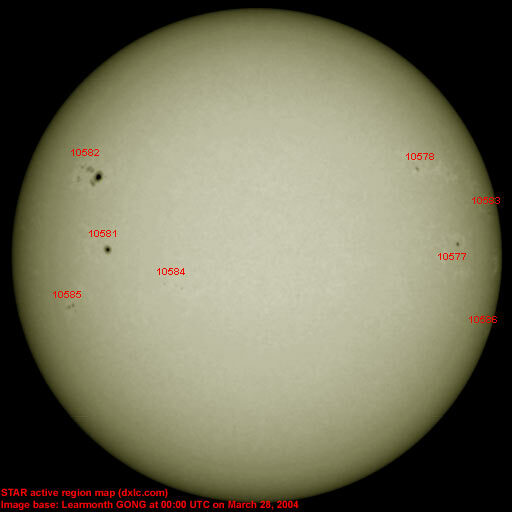 New region 10586 emerged quickly near the southwest limb early on March 27. The region is rotating over the limb. 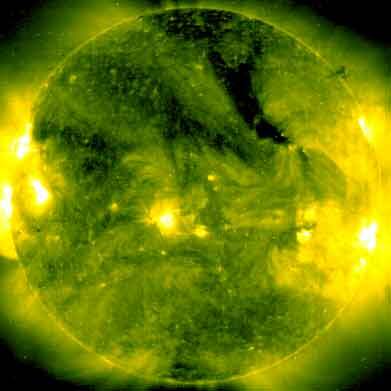 Flares: C1.3 at 09:49, C1.4 at 12:57, C1.9 at 14:32, C1.7 at 16:46 and C1.0 at 19:42 UTC. March 25-27: No partly or fully earth directed CMEs observed in limited LASCO data. The geomagnetic field is expected to be unsettled to minor storm on March 28-29 and quiet to active on March 30-31 due to a high speed stream from coronal hole CH87. Long distance low and medium frequency (below 2 MHz) propagation along east-west paths over high and upper middle latitudes is very poor. Propagation along long distance north-south paths is poor to fair. [Trans Atlantic propagation conditions are currently monitored every night on 1470 kHz. Dominant stations tonight: Radio Vibración (Venezuela) and CPN Radio (Perú)].